Austinites will vote on a proposition to approve $1 billion in transportation funding this Election Day, which could support building a light rail line through downtown. If you believe some folks pushing for Proposition 1, the proposed new light rail line could help. “It's just going to have a huge impact on the overall traffic we have in this community,” says Greg Hartman, President of academic medicine, research and external affairs for Seton Healthcare Family. He's also the treasurer for the Let's Go Austin Political Action Committee. They're supporting Prop 1 with a catchy slogan you might have seen around town: "Traffic Bites. Bite Back". Selling mass transit as a way to ease traffic congestion is nothing new, but is it accurate? 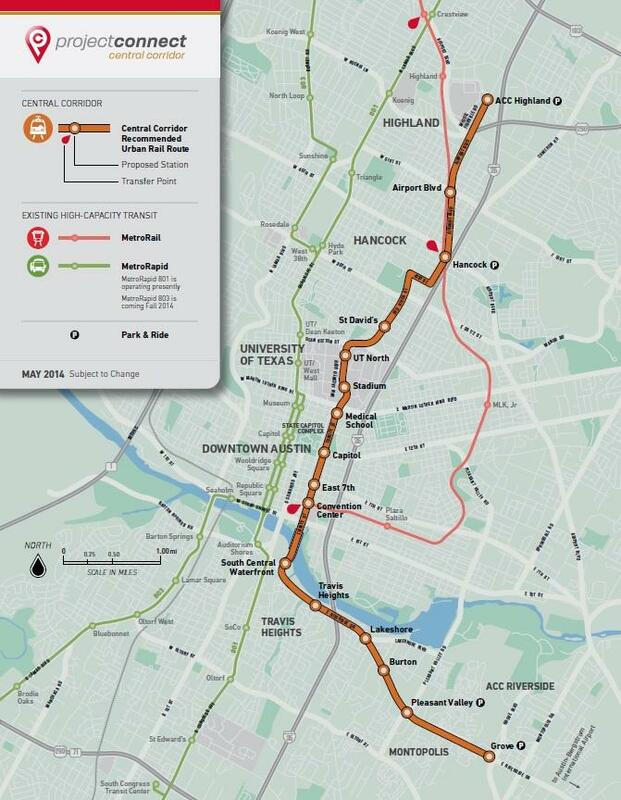 Does putting in a light rail line actually do anything to ease traffic? Opponents of the project, like Jace Deloney say, ultimately, it doesn't. "We are never going to solve congestion,” Deloney says. “Congestion is a symptom of a successful city." Deloney is a local transit advocate and board member on Austin's Urban Transportation Commission. He opposes the plan, he says, because it's too costly and poorly planned. “If you look at any city across the world, you have congestion. This rail proposal won't solve the situation on I-35 like it's being pitched,” Deloney says. "And I think it's dishonest to say that it will." While both Hartman and Deloney’s arguments seem intractable, it turns out there's a consensus on this issue. Because there are case studies demonstrating whether transit projects like Proposition 1 have an impact on congestion. Jeff Wood is with Overhead Wire, a San Francisco-based consulting firm. He says these sorts of projects, despite being billed as traffic-busters, actually create congestion. The map of proposed routes for rail. “When the road gets emptied out by other modes or carpooling or anything like that, it tends to fill up with other drivers,” Wood says. The phenomenon is called induced demand. “Basically, the road fills up with car drivers because the road becomes less empty,” he says. “You see this in cities all over the county, where we reduce the number of people that are driving, but then the drivers fill up that space again." If you don't believe an out-of-town transit expert like Wood, maybe you’ll believe the guy in charge of coming up with Austin’s rail proposal. "Can we solve the congestion problem?” asks Kyle Keahey, project lead for Project Connect. “That is something that quite honestly never gets solved." Keahey says the project isn’t a fix, but that the project seeks to create alternatives to drivers being stuck in their cars on congested roadways. Right now, Austin is the fourth most congested city in the country, between New York and San Francisco — both places that, like Austin, are highly desirable locations. They also have more robust transit systems that many in Austin envy — more alternatives if you don't want to sit in traffic and opt to take mass transit instead. But, still, there’s plenty of congestion in both of those cities. So, if light rail and road expansions won't solve the problem of traffic, what will? One option is an economic downturn. Detroit, for instance, isn't seeing much traffic these days. But, obviously, Austin doesn't want to go down that road. So what else could the city do? Wood says one option is called congestion pricing, which basically charges drivers to use roads when they're busiest. He says congestion pricing would discourage some commuters on I-35 from traversing their well-worn routes. “You switch the designation of I-35 to SH-130, and then you congestion price into the center of the city, or through traffic on I-35, and you might actually see an appreciable result in terms of reduced congestion,” Wood says. Charging people just for the privilege of driving into the city is an idea that's had success in major cities like London. It would face an uphill battle in a place like Austin, of course. And it could well be unconstitutional. “You’re paying for it either way. 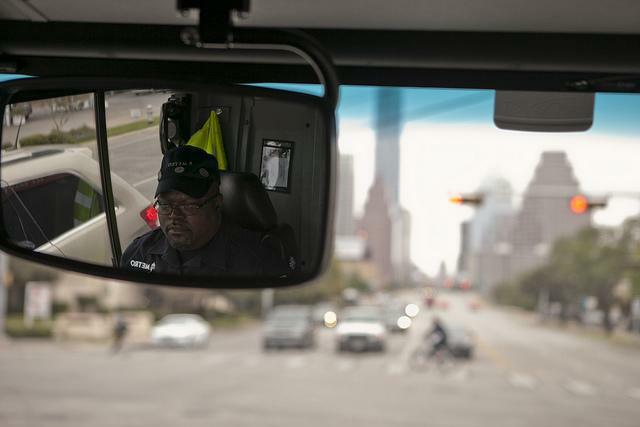 You're going to lose time in your car, which as the Texas Transportation Institute says costs billions of dollars a year,” he says. “Or you're going to pay for the road to be open." 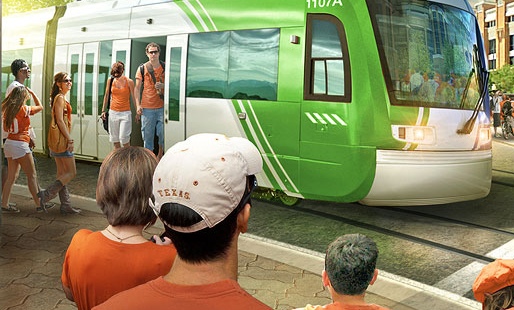 Austin officials unveiled plans today for the city's first urban rail line. The 9.5 mile long line would run along East Riverside Drive and turn north near the Austin-American Statesman building, cross Lady Bird Lake via bridge, continue through downtown and the University of Texas and end at Highland Mall. The plan also calls for four park & ride areas, two each toward opposite ends of the line. The project cost is estimated at $1.38 billion. Officials with Project Connect, the working group of city, Capital Metro, and other regional transportation officials that made today's recommendation, say they believe the federal government would pay for half of that estimated cost. By a unanimous vote – Austin city council endorsed a package of proposed transportation projects Thursday night, including a $1.4 billion dollar urban rail line. 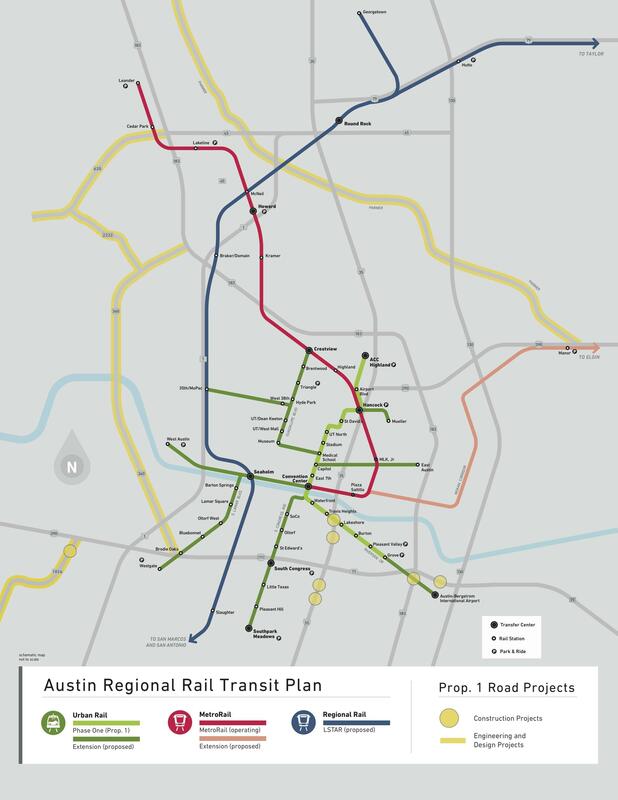 The Austin City Council limited public comment on urban rail to 30 minutes for each side, which angered some public transit advocates who support the concept of urban rail but reject the proposed route of the plan.